●Advanced A2DP and EDR Bluetooth profile. 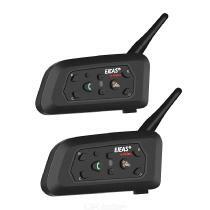 ●Receive audio navigation message from Bluetooth enabled GPS. ●More stable structured button panel shows better waterproof performance. ●Wind noise DSP cancellation guarantees crystal clear voice at high speed. ●Fit all kinds of helmets (open/ full/ half face). Ideal for any motorcycle helmet and skiing helmet. ●Full duplex interphone. Support 6 riders in pairing, a host and 5 auxiliaries. After pairing, the host can choose any one of the 5 to talk to. ●Wireless communication between rider and passenger on back seat, hand-free for answearing cell phone, enable your driving intently and safely. ●Wireless Bluetooth music receiver and speaker, enjoy streaming music from cell phone or other devices through A2DP. ●Wireless headset for Bluetooth, enable cellphone at a range of up to 10m/33ft. ●Automatic switch among Bluetooth cell phone, intercom, stereo music.